Branding. It all starts with branding. You can have a multi-millionaire presidential candidate, a small team of experts in election law, press releases, ballot access, and whatnot – and still get nowhere if you don’t have the right branding. Get the branding right, and you have a chance even with far less resources to start with. Don’t get me wrong. Branding is not a magic bullet. Getting a successful political party off the ground involves a huge amount of work. But as I showed in Part 1, the U.S. political system is rigged against third parties, but there is a big loophole if you have the correct positioning. The party cannot be too radical. U.S. elections are about crafting pluralities, or even majorities. You can win 10% of the total votes in the nation and not win a single seat. You have to win somewhere. At the moment Donald Trump is threatening to move the Republican Party into that void. In many respects he has moved the party way to the Left of where it has been since Reagan. (He’s calling for enforcing a national picket line – a big change from Strikebreaker Ronnie. Of course, Trump’s proposed policy is only locally left. Globally, it is a move to the Right.) Whether Trump will move the government in a more or less libertarian direction is extremely unclear. At times he talks like an authoritarian madman bent on world plundering. At other times he hints at a less aggressive foreign policy. He is likewise all over the place on domestic policy. So keep this opportunity in mind just in case. Besides, Trumps American Party takeover of the Republican Party may not last. But there are plenty of other opportunities. This site is organized along four dimensions: liberty, equality, nature and morality. That gives us eleven other possible two dimensional political maps to play with to look for market opportunities. If we consider more that two dimensions at a time, we get even more possibilities. And there are more dimensions one can consider. 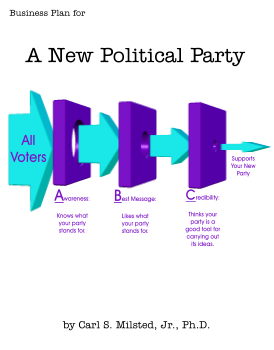 Positioning is a start, but you need to go further to successfully brand a new political party. Maps of dimensional projections are all fine and dandy for strategizing, but have limited power for outreach. Believe me; I’ve tried it in the field. 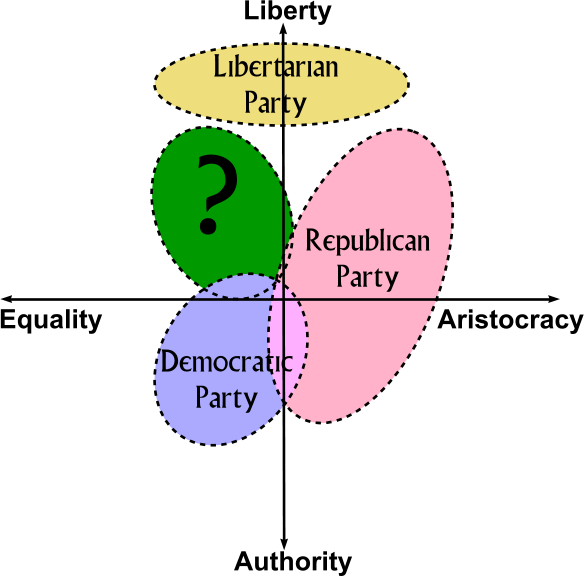 The Libertarian Party has used the Nolan Chart political map for outreach for many years. Millions of copies of the World’s Smallest Political Quiz have been handed out. I crafted my own Nolan Chart based quiz to better find moderate libertarians. The outreach power was…limited. To economically find and require the core for a startup party you need to go into full Mad Men mode. Put on a well-tailored suit, pour yourself a scotch on the rocks, light up some cigarettes; it’s time do some serious brainstorming. What sort of people are likely to join your party in its early stages? Where do they hang out? What shows do they watch? What sort of image would they want to convey by joining your movement? What’s a good logo to convey that image? What’s a good name for your party? You need to grab people subconsciously so they stop and read your in depth propaganda later. (Note that I am doing a poor job of this on this web site! This site is tailored to earliest adopters only.) Ideally, you want to grab the attention of connected groups of people. Solo political partying is not sustainable. There is more than one possible branding for any particular political position. Consider libertarianism as an example. There is the defensive backward-looking defend the Constitution brand epitomized by Ron Paul. There are the haughty Objectivists, dangerous survivalists, dogmatic Rothbardians, peace loving pot heads who understand economics, John Birch conspiracy theorist types, Friedmanite utilitarians, science fiction geeks who really enjoyed reading Heinlein, and the all around gun-toting economists on drugs. There is overlap between these groups. You will face similar challenges putting together your coalition. But when your coalition gets big enough to accomplish something, your diverse coalition will be glued together by the common cause of political power. (This is what allows the Democrats to get church-going gun-toting union workers to work with radical lesbian feminazis and suchlike.) But when the stakes are still low, it is very easy for factionalism to blow things apart. Which are willing to join a cause long before it has a chance of winning? Which are willing to work hard? Which play well with others? Which are popular with the outside world? Which are repellent? Let’s take the example of libertarians again. Objectivists have a moral problem with doing anything that reeks of altruism. This limits their roles as donors and activists, especially when victory is but a glimmer in the future. Conspiracy theorists sometimes work very hard, but they often turn off the outside world, and also quit at inopportune moments, due to suspicion or a perceived slight. Radical Rothbardians will work extremely hard – but direct a significant fraction of their energy purging the party of pragmatists. When crafting your brand you want to initially attract idealists who work hard and play well with others. But you also want a brand that continues to work for you as you grow into major party status. Can your brand eventually attract tens of millions of passive members who do nothing more than vote for your candidate? But the Constitution brand is self-limiting. It looks backwards. It yearns for a bygone era when the actual text of the Constitution was held in more reverence. There is a problem with a backward-looking brand: the Good Old Days…weren’t. The Good Old Days included horrible pollution, excessive child labor, malnutrition, dire disease, brutal working conditions and more. True, we can attribute these bad things to lower technology and fast population growth. But branding is association. There is a deeper problem with the Constitution brand that is more directly political: racism. The original Constitution was written by and for racists. True, with the 13th-15th Amendments in place, the explicit racism has been repealed. But backward branding coupled with reverence for the Founding Fathers carries a racist taint. Even though African Americans stand to benefit the most from an end to the Drug War, the libertarian movement has had great difficulty recruiting from that demographic. Meanwhile, overt racists keep surfacing among the activist base surrounding Dr. Paul. The subtleties of branding matter. In the chapters to follow I’ll float some ideas for a wide assortment of possible third parties. Do not take them all as serious proposals! These are meant to be examples to inspire creativity and thinking ahead. A few might have the potential for serious traction. But I’ll leave it up to you, dear readers, to decide which.